The base of our challenge consisted of HTML and CSS which constructed the Alien body. Divs were used to create individual parts of the Alien including the monster, body, ears, mouth, tooth, and eye. CSS was used to style the individual elements. See the codepen demo for the base CSS used. Since the whole page is to be tracked for cursor movement, we assigned the parent ufo div to a variable called ufo. An addeventListener() method was used to track the mousemove event. Hence, once the mouse is moved over the selected area (ufo) the event function triggers. Next, the eyes element is selected from the DOM and assigned to a variable - eye. The getBoundingClientRect() method is used to get the top and left position of the eye element relative to the viewport. This comes in handy when we would like to determine the relative position of our element with respect to our viewport. We employ a formula to calculate the angle of the mouse cursor in degrees, relative to the eyes element. This converts radianDegrees into a rotation degree with a range from 0 - 360degrees depending on the position of the cursor. 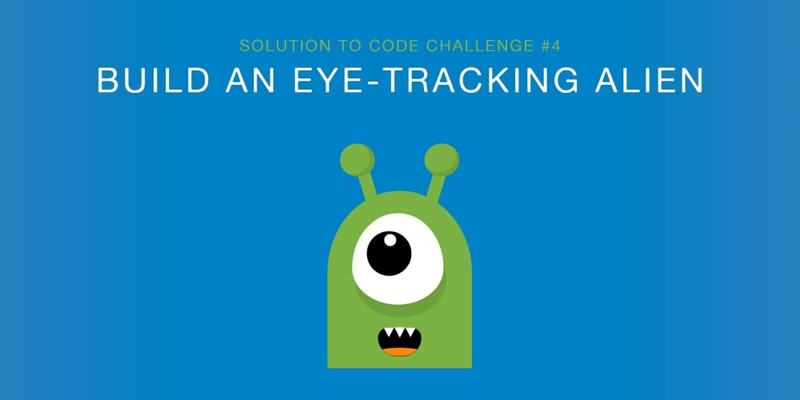 So far I believe we have learned a number of things from this awesome challenge including cursor tracking and simple CSS animations, let&apos;s look forward to the next challenge on Monday. Happy coding!